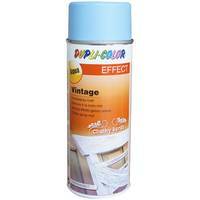 DUPLI-COLOR Vintage Spray is a chalk-effect spray for decoration purposes. It makes a mat finish. In the fields of decoration, furnishing, design, restauration or interior fittings more beautiful living is actually connected with the orientation to weathered shabby chic. 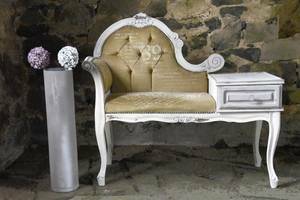 Whether vitrines, chests, pictures frames, tables, decorative objects, suitcases or caskets - they all are trimmed to an individual old or used look. Flaws made during spraying can be corrected within 10 minutes after application. Within this space time the "open" paint layer can be washed off with water and soap. Final surface hardness is reached after 12 hours. The surface must be clean, absolutely fat-free and dry. In spite of low formation of spray mist, we recommend to protect the surrounding area. 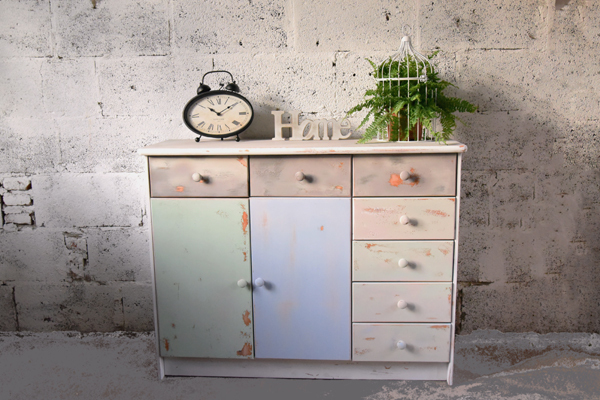 If necessary, remove or sand old paint layers. The optimal distance to spray is approx. 25 cm. Spray several thin layers in 2 minute intervals. After spraying turn the can upside down and press sprayhead to empty the valve.